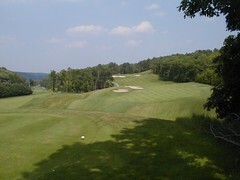 This was the first of the Treetops Courses and was the start of the Golf boom in Gaylord. It gave Gaylord a “Name” course, and then courses started popping up like mushrooms. 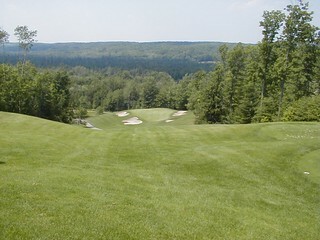 There are now five courses at Treetops, (I haven’t investigated lately, so there may be more) but this was the one that got it all started. 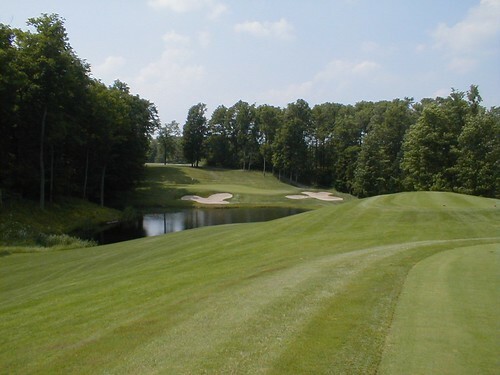 Let’s be up front here: this course has one of the highest slope ratings in Michigan. For those of you that are not familiar with slope ratings, that means this baby is tough. So I suggest you bring a piece of humble pie when you tackle this one. And just maybe, a few extra balls. Is it too tough to play? By no means. I suggest you stick to the white tees , if you expect to come anywhere close to your normal score. When you get back home and tell your friends about the Jones, you will talk about how tough she was (it’s okay to lie a little about your score on this one) but you will talk even more about the scenery. Believe me, the scenery is worth adding a few strokes to your normal game. Women love this course more than the men do. Must be the scenery thing; also they don’t have the egos to get bruised that men have. The thing that sticks in my mind is how high a lot of the tees are above the fairways. Sometimes it seems that you are teeing off the rim of the Grand Canyon. Well, that may be stretching it a bit, but you get the idea. We seldom get to see this kind of a hole on a golf course, but on the Jones you will see many. Sometimes you will be playing along the floor of a tree-lined valley… sometimes along the top of a ridge that just waits to grab your ball and pull it down among the trees… sometimes from ridge to ridge, with some nasty ravines in between full of stuff that loves to feed on things called Titleist, Top-flite or Ultra. Is there room for mistakes? Sure, but not much. The greens are plenty big enough to make us all happy. At least until we look at a forty foot putt or so, with a knoll or two between our ball and the hole. Then we wish the greens weren’t quite so big. Best advice I can give you on how to putt these greens is to chip close. If you read my article on “The Mysteries of Putting” you will know why. If you get home in two on the par fives, chances are your knuckles drag on the ground. So don’t count on an easy bird. In fact, don’t even count on an easy par. 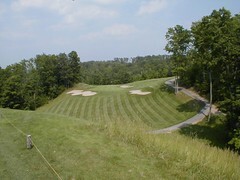 From the white tees the length is not the problem because they range from 430 to 500 yards. The trouble is keeping the ball in the fairway. What you think is a good drive may surprise you. Keep the ball under control and you’ll be okay. Try for that few extra yard off the tee, you may find out the meaning of the word scramble. The par threes range from awesome (view on #6 with a 120 ft. drop) to quietly spectacular (the pond and well bunkered green of #13). Elevation changes will make you think a little longer on your club selection. Number 4 seems to have begged the question, “How could I be short?’ many times. You may want to use 2 more clubs than the yardage indicates. The Golf Gods seem to favor this hole. This course can play tough (whites), mean (blues), or sadistic (black). The low handicap golfer probably will want to play the blues, although if you come within four or five of you handicap from the whites you played a great game. There is about 100 yards difference between the white and black tees on some holes. Put this one on your must play list.